Custom wallpaper allows you to decorate your home like never before. We'll show you different ways that images can be used to create custom wall murals and wallpaper patterns. This is the blog of Great Wall Custom Coverings, designer and manufacturer of custom wallpaper for both residential and contract markets. In the title of this post, "movement" refers to the inner workings of a watch or clock, not motion in general. The movement specifically refers to all of the moving parts, save for the clock hands, that keep your clocks ticking away. I've had a gear-inspired wall mural in mind for some time but finally just came across this perfect image to bring the idea to life. All the gears, pulleys and wheels create a look not unlike a bank vault, especially when you consider that this macro shot is enormous compared to the real thing. I think any disassembled machinery has the makings of a perfect custom wallpaper application. I did a post a while back concerning circuit board custom wallpaper, and received a lot of positive feedback from it. Apparently there's a lot of you out there that enjoyed destroying your toys as youths as well! 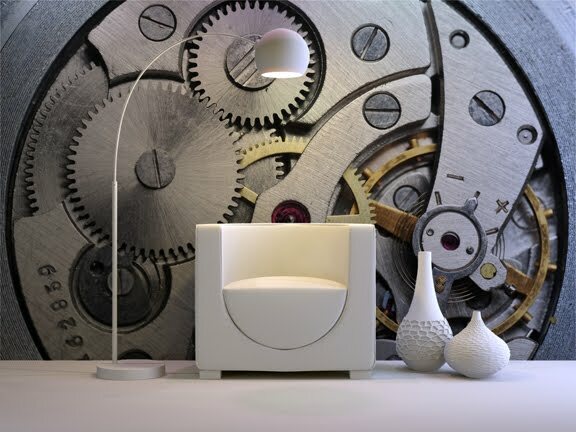 I initially wanted to crop the image further, but the circular outline around the watch's inner workings framed the furniture arrangement so well I kept it as is. How cool would this wall mural be in your home? Showing your love of the mechanical and orderly, while at the same time also embracing your aesthetically-minded side. How well rounded can you get? Have an idea for your own custom wallpaper installation? Contact us to begin your project. The blog of Great Wall Custom Coverings, designer and manufacturer of custom wallpaper. Discussing the art of custom wallpaper, ways to use custom wall murals, digital photography projects for interior decorating, and custom wallpaper inspiration.